The 2018 NFL Draft class at wide receiver boasts a wide variety of pass-catchers, from big targets with sure-hands to shifty, inside receivers with a great first step. At Pro Football Focus, not only do we grade every single player on every single play of every single game, we also track several other data points for every player on every play. This amount of data puts PFF in a unique position during draft season, as we can truly showcase where certain players saw success and where others saw troubles. 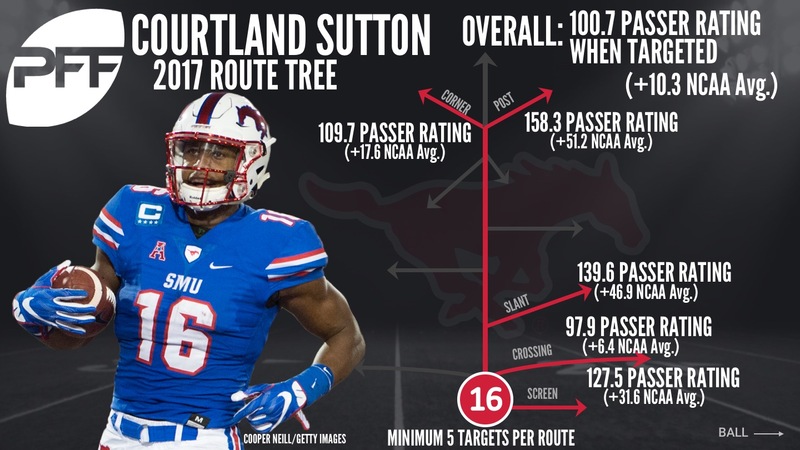 With the 2017 NCAA average for every route listed above, here’s how well each of our Top 10 wide receivers for the 2018 NFL Draft fared across the route tree in 2017. To avoid a small sample size either harming or inflating a player’s numbers, a minimum of five was set on the amount of targets per route to showcase the effectiveness of each receiver across the field. It’s no surprise that Gallup, our No. 1 wide receiver, won across the route tree in 2017. He finished the past two seasons in the top 10 in yards per route run among the draft class, including the eighth-highest total this past season. He was particularly effective in the short and intermediate range and was heavily utilized in the screen game at Colorado State in 2017. 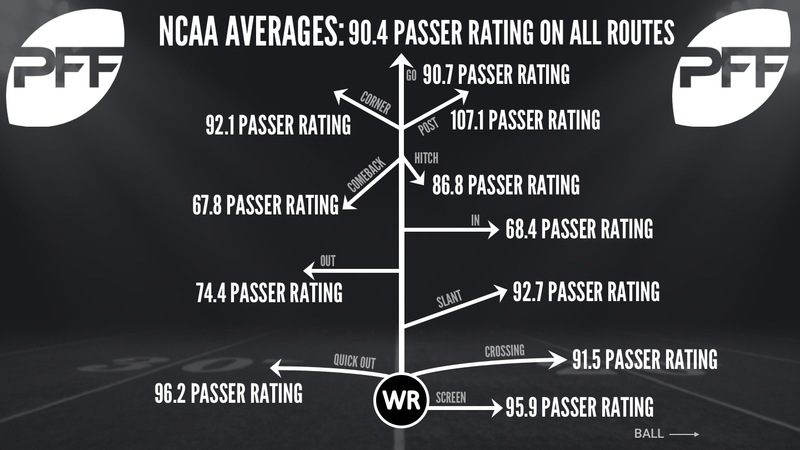 Gallup was targeted 34 times on screens and fielded a passer rating 13.9 points higher than the NCAA average. 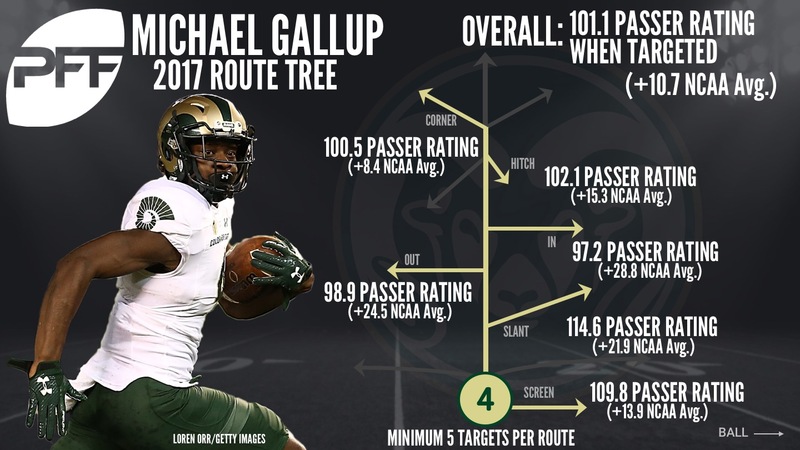 He wasn’t limited to just the shorter distance routes, as Gallup also saw positive passer ratings on corner routes, hitches and posts. Most notable was his ability to separate off of a hitch route, where he hauled in 19 receptions on an average depth of 8.3 yards while averaging 4.4 yards after the catch. 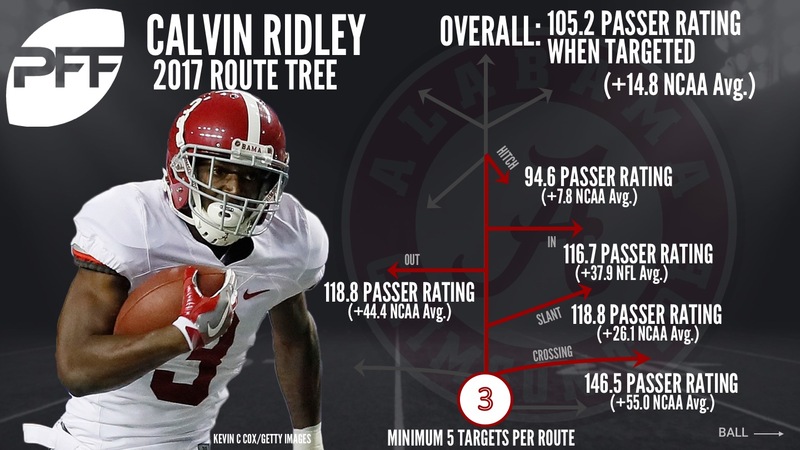 In Alabama’s passing attack, Ridley was by far his quarterback’s favorite target in 2017, seeing 98 of the team’s 208 targets to receivers. Where he really shined the brightest was his prowess on in-breaking routes, and most notably among those was his near-perfect passer rating of 146.5 when targeted on crossing routes. Ridley averaged 11.6 yards per reception on crossing routes and he hauled in two touchdowns on 10 receptions and averaged a depth of 12.1 yards on his targets. Overall, Ridley hauled in over 100 yards on six different routes in 2017 (slant, in, hitch, post, go and crossers). 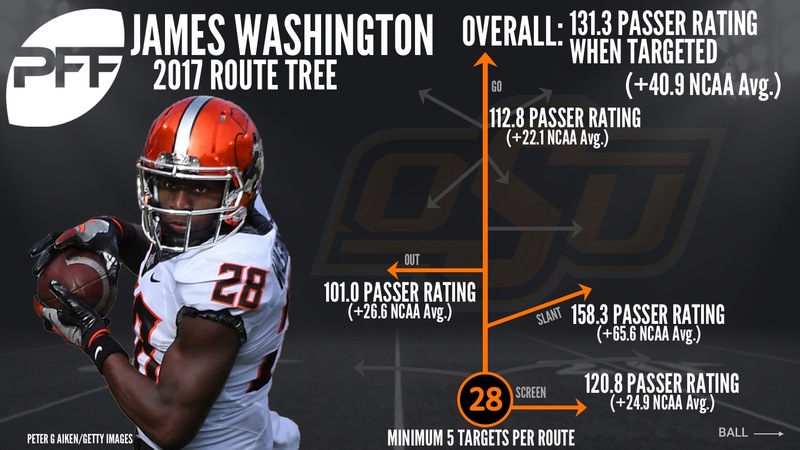 On thing jumps out immediately when looking at Washington’s route tree – his prowess on the infamous ‘go’ route. It was his most targeted route in 2017, but for good reason indeed. He was targeted a whopping 27 times on ‘go’ routes, and hauled in 11 receptions for 408 yards and averaged a depth of 37.1 yards per target. Not to be lost, though, was Washington’s great first step and ability to separate on slant routes over the middle. He was targeted 11 times, bringing down all 11 of them for 173 yards while averaging a massive 9.3 yards after the catch on slants in 2017. All told, he saw a perfect passer rating of 158.3 on slant routes and an average depth of target of 9.8 yards. Interestingly enough, Sutton was an equal opportunity receiver, lining up wide right on 379 snaps and wide left on 376 snaps. He had almost equal results from either side as well, bringing in six touchdowns from each outside alignment and he had 142 yards after the catch from the right and 140 YAC from the left. He hauled in his most touchdowns on ‘go’ routes, but his quarterbacks also tossed four interceptions when targeting him on a fly. Where he really shined was on posts, as noted by his perfect passer rating on such routes. In total, four of his five best routes came on in-breaking routes, showing he is not afraid to work over the middle. 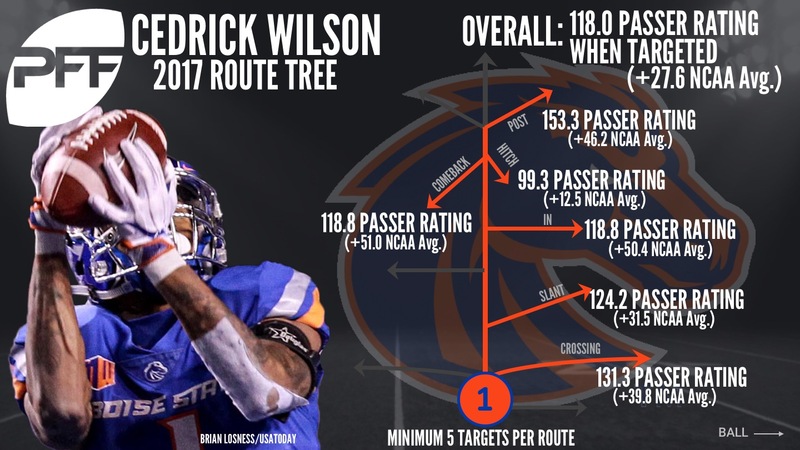 One of the more dominant receivers on seemingly every in-breaking route in 2017, Wilson’s route tree is a thing of beauty. On five separate routes, he had a passer rating 30.0 or more points above the NCAA average, including four on those in-breaking routes. He was dominant on post routes, bringing down 5-of-7 targets for 175 yards, a season-high two touchdowns and he averaged a massive 32.1 yards in depth of target, showing he is a very reliable threat down the middle of the field. 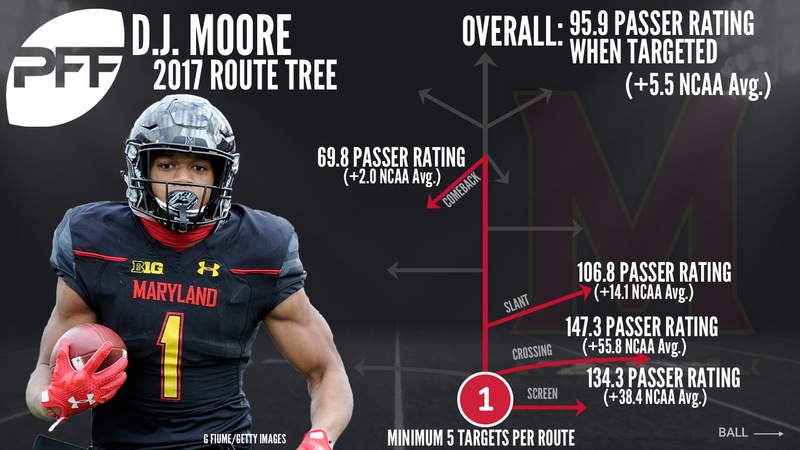 Don’t let the narrative hang on Moore, he played much more outside receiver in 2017 than he did slot, and while some may project him to the slot at the next level because of his style of play (and frame: 6-foot, 210-pounds), he was still more than capable of getting it done from the outside. He was clearly at his best with the ball in his hands quickly, as on his two best routes — crossers and screens — he saw an average depth of target of 3.0 and -0.6 yards, respectively. He averaged 9.9 yards after the catch on crossers and screens combined, a clear reason why he was able to tie for the draft class lead with 20 forced missed tackles. 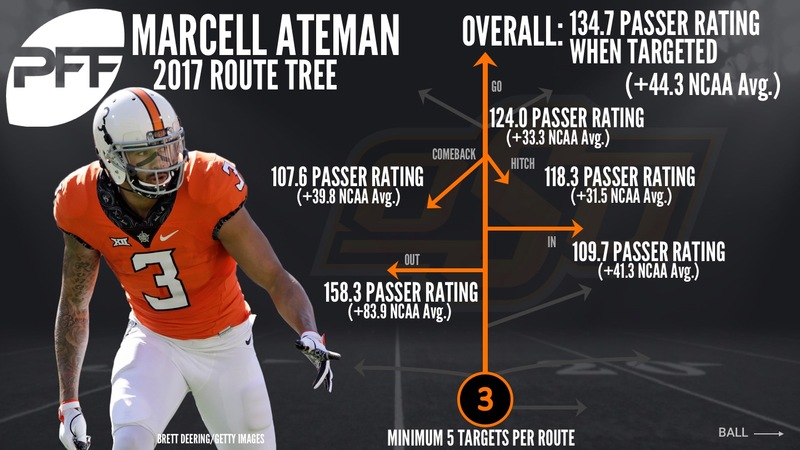 Much like the aforementioned Washington, Ateman also saw great success on ‘go’ routes in 2017, as he was targeted 25 times and brought down 10 receptions and three touchdowns on the route. He also saw success on other long-developing routes, including comebacks, posts and hitches. Also like his teammate, Ateman generated a perfect passer rating on a specific route — the out route. He brought in 13-of-16 out route targets last season for 288 yards, two touchdowns and a season-high 102 yards after the catch. His work on out-breaking and in-breaking routes shows he is more than just a big target to throw it up to. 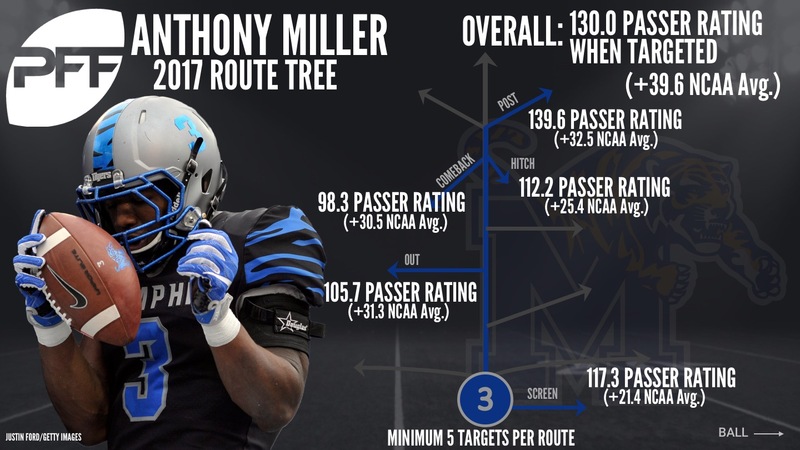 While Miller was heavily targeted in the Memphis passing attack on screens (41 targets), his prowess on longer-developing routes was something special in 2017. On his four best routes (in terms of biggest difference in passer rating between him and the NCAA average), Miller’s average depth of target was considerably longer than his other routes. Perhaps most impressively, on post routes, he saw a passer rating of 139.6, 32.5 points higher than the NCAA average, and had an average depth of target of 26.6 yards downfield. He hauled in 11-of-20 post route targets for 280 yards and three touchdowns. His downfield ability was also noticeable in the fact that he brought in a touchdown on 8-of-9 ‘go’ route completions a season ago. His downfield catch radius and his ability to make defenders miss should make Miller a very valuable asset to his future NFL team. 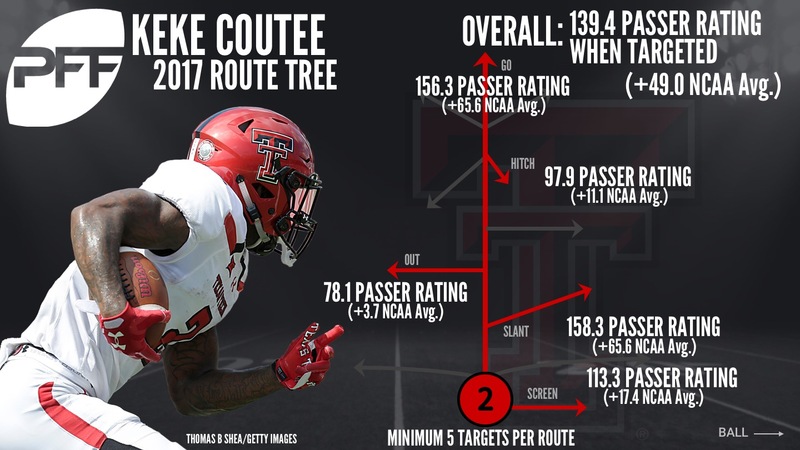 The Red Raiders’ most targeted receiver in their ‘air raid’ offense, Coutee was seemingly unstoppable in 2017. He caught all 10 of his touchdowns from the slot this past season but was a tremendous asset on ‘go’ routes. He brought in a remarkable 75 percent of his fly routes at an average depth of 30.1 yards per target and had four of his 10 touchdowns when running a ‘go.’ Equally as impressive was his ability to bring in slant patterns and to make defenders miss. On 10 slant targets, Coutee brought in nine receptions for 240 yards, 180 of those after the catch, and two more touchdowns. His short range shiftiness and ability to stretch the field vertically together should go a long way at the next level. 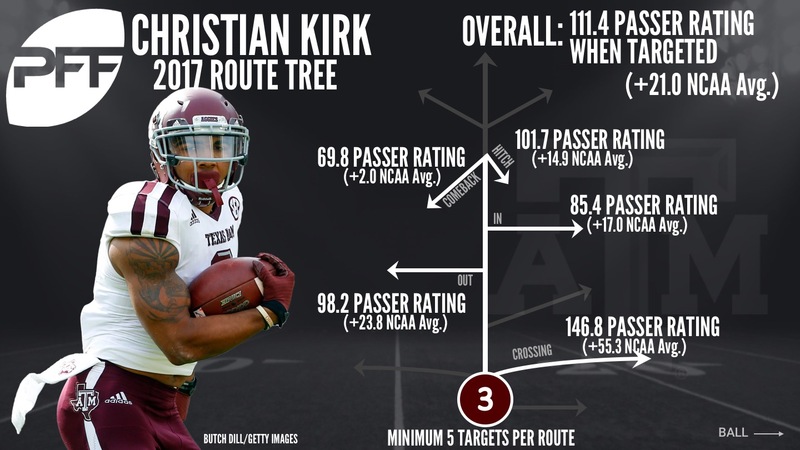 Kirk is another receiver on our list with a wide open route tree. He found success on both in-breaking and out-breaking routes but was at his best in the intermediate range of the field. He had an average depth of target of 14.8 on crossers and of 10.2 on his out routes, on both of which he held a drastically higher passer rating than the NCAA average. Kirk racked up an impressive 14.0 yards after the catch on his six crossing route receptions last season.